Although the TOEFL (Test of English as a Foreign Language) or the IELTS (International English Testing System) are not mandatory for admission into McDaniel Budapest, a good working knowledge of English is essential. Students will be required to satisfy the TOEFL/IELTS requirement by the end of the 2nd academic year. 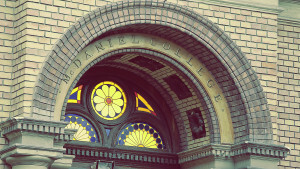 McDaniel College Budapest has a multicultural student community, ranging from native speakers of English to student coming from countries in which the official language of instruction at school is English, students having graduated from American or British international schools. A good command of English is one of the keys to success at college. Applicants that can provide proof of proficiency in English for admission (have taken either the TOEFL or the IELTS and present the score records) will have an advantage when the College evaluates and ranks applications. Students with appropriate scores on the language proficiency tests (at least 80 on the TOEFL Internet-based test or 6.5 on the IELTS will be granted merit-based discounts from the tuition fee. If you have not taken either of the above language proficiency tests, nor have you graduated from American or British schools but you feel that the level of your English is at least upper intermediate and you have appropriate academic qualifications, your application will be given favorable consideration. Should it, however, turn out on arrival that the assessment of your language skills was wrong, you will be referred to the ten-month McDaniel Foundation Program that will help you improve your language skills before entering the four-year degree program. Admitted students interested in majoring in Business and Economics will be required to take the Math Proficiency Test (Arithmetic and Basic Algebra) at the beginning of the first semester as the passing of the test is a prerequisite for courses in the above fields of study, Students having failed the test will be referred to a Mathematics Workshop which will help them brush up their high school knowledge in basic Mathematics. Psychology majors are expected to satisfy the Math proficiency requirement by the end of the first academic year.